The Audi R18 e-tron quattro, powered by Williams Hybrid Power’s innovative electric flywheel hybrid system, impressed on its first competitive outing in round two of the F.I.A World Endurance Championship. The second race in the 2012 calendar saw teams head to Belgium for the WEC 6 hours of Spa-Francorchamps. The Audi R18 e-tron Quattro #2 set the fastest time in Friday’s qualifying and its sister car finished in second place around the famous circuit after dominating the early stages in difficult wet conditions. The race at Spa-Francorchamps can be seen as a ‘’dress rehearsal’’ for the Le Mans 24 Hours next month. By proving its capability on one of the world’s most challenging circuits, the signs are positive for the R18 e-tron quattro’s chances of success at the 80th running of the world’s most famous endurance event. Williams Hybrid Power designed an entirely new, ultra-lightweight electric flywheel and associated power electronics for the Audi R18 e-tron quattro, delivering 150KW of power with a top rotor speed of 45,000 rpm. The key benefits of the WHP system are a high power density and correspondingly low mass, the ability to continuously deep power cycle, high efficiency energy transfer to and from the e-storage, and an insusceptibility to performance or life degradation over a wide range of operating temperatures. These defining features are highly suited to endurance racing and made the WHP flywheel the prime candidate for Audi’s project when compared to other technologies such as batteries, ultra-capacitors or mechanical flywheels. 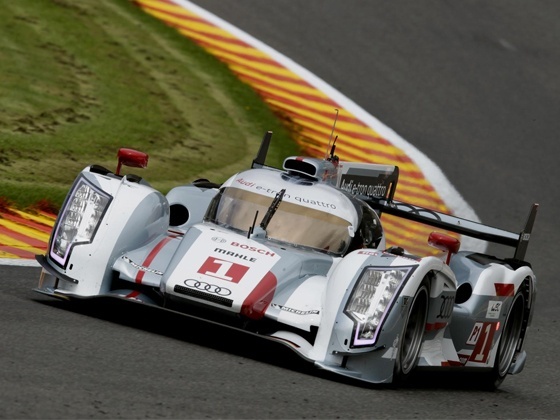 André Lotterer, one of the drivers of the Audi R18 e-tron quattro #1, commented, "A fantastic race for Audi with a 1-2-3-4 victory. When I was sitting in the car at the beginning of the race in the rain I particularly enjoyed the technology of the R18 e-tron quattro. Even though the technology is brand new it functioned superbly. Unfortunately, we didn’t keep the lead but we’re still in a learning phase. On the whole, though, it was a nice beginning before the really big challenge, the Le Mans 24 Hours."